Gay Pride in a small town. I live in a town of 6,000 people, 20 churches, 30 art galleries, one Non-Super Wal-Mart, and no shopping malls. Bare dirt walkways exceed the number of side-walks by a large margin. And I like it that way. But it is still full of surprises. A month ago, a chapter of PFLAG started here. And then a dedicated young man, Robert Quintana, began organizing a Gay Pride event for this summer, the first ever. 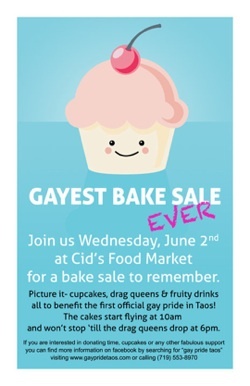 It started with The Gayest Bake Sale Ever. Which raised $1,400! I just love this flier! Keep an eye out for the Gayest Car Wash Ever. Just kidding! But there really will be a huge car wash in early August to raise money for Pride. And dozens of clean cars in town for days afterwards. After that, there will be galas and parties, culminating Pride in the Park, a picnic with booths, live music, entertainment, and freebies. Come join the fun on August 21st at Kit Carson Park! It makes me proud to live here. I have plenty of problems: too many ex-boyfriends, a summer job I hate, a best friend I’ve neglected, and a certain hot skateboarder…but I’m not going to think about him. I’m not. But my biggest problem of all: living with my grandma the famous ADVICE COLUMNIST Miss Swoon! No offense to you–I’m sure you give great advice–but Miss Swoon is just making things worse. I’ve got affirmations scrawled on my arm in Sharpie and I STILL can’t stop thinking about, you know, a certain male member of the species. Or you can prank him in some unforgivable way. Tag his skateboard with a pink sticker. Loosen the screws on his wheels. Actually, though, I may be projecting because of a certain hot skate-boarder that three-timed me. Your hot skate-boarder is probably a cut aboe. And he might take your mind off your nosy grandma and those annoying nick-name giving ex’s. Please don’t worry about offending me. Advice columnists can never solve their own problems, so relish mucking around in everyone else’s business. No joke. I have no idea what I’m talking about most of the time. But this time I’m right. So go for him! Letter provided by the awesome and amazing (and prolific) Sydney Salter, author of SWOON AT YOUR OWN RISK and MY BIG NOSE AND OTHER NATURAL DISASTERS and JUNGLE CROSSING.